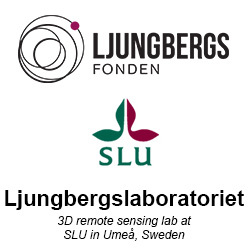 Ljungbergslaboratoriet is a 3D remote sensing lab located at the Swedish University of Agricultural Sciences in Umeå. The investment comes from Ljungbergsfonden. The current project started in 2017 and is due the end of 2019. The lab opened in 2014 thanks to investments by Ljungbergsfonden, Önnesjöstiftelsen and Anna och Nils Håkanssons stiftelse. Here are some photos from the opening of the lab.